As agencies around the world continue to cut award show budgets, top Canadian creative directors converged in downtown Toronto to protest. Over the past year, politics have found a way to dominate everything from our television sets to our newsfeeds and collective psyches. And while it’s safe to say we’ve all had enough of it, politics have a funny way of dominating advertising award shows too. As Canada's largest and premier creative awards show, the Marketing Awards set out to change this perception. To promote the final call for entries, they have also released two politically inspired videos featuring top Canadian creative directors protesting agency award show budget cuts. 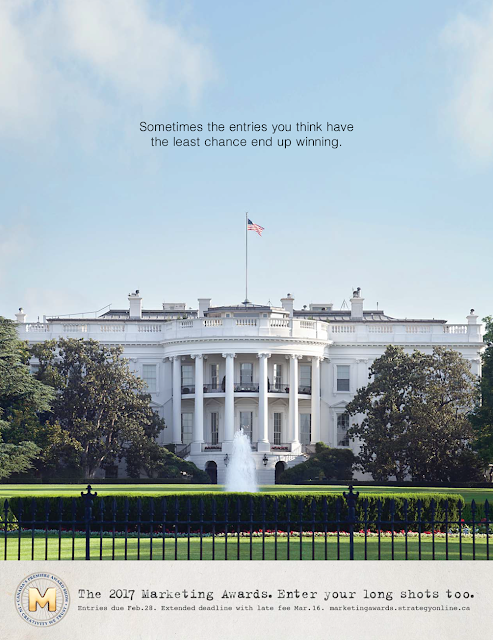 The call to entry campaign was rounded out with online banners, e-blasts and social posts that applied common political jargon to the awards show itself. Some of the slogans included "Occupy the podium", "Build that awards wall" and "Dog walkers have rights too." "From jury selection to the deliberation process, we’re doing everything in our power to keep politics out and let the best work win,” says Mary Maddever, SVP Brunico Communications, publisher of strategy, which runs the Marketing Awards. "With awards budgets being under siege, it’s important agencies know this. We also believe that in an era of data and tech-driven decision making it’s time to stand up for the power of pure creativity – it is worth celebrating in its own right."